Location: Sightings and mythology in the area of East and Central Africa. Similar sightings in the Caribbean Islands. Time: Originates from tribal African mythology, supposed remains found in 1944 and 1959. Dragons and serpents are common mythological subjects, all over the world. In east and central Africa, there are many myths and local names for an unknown venomous snake, which seems very bizarre. Said to be up to 6 metres long, venomous, and possessing a rooster-like comb, males also have cheek wattles. It also is claimed to have the ability to cluck and crow like a rooster, and to prefer eating maggots attracted by what it kills, instead of the prey itself. Mainly inhabiting large trees, it strikes at its prey from above. As pointed out by Darren Naish, these parts of Africa are well studied by herpetologists, and the supposed presence of a huge, strangely ornamented snake seems very unlikely. Indeed, the mythology of this creature recalls many European myths of cockerel-like dragons; it even shares their ability to kill with a mere glance. Two cases of note involve people finding the remains of these creatures, but the reliability of their identification is probably not correct. The myth of a rooster-like venomous snake may stem from the fact that black mambas, who have had trouble shedding their skin, sometimes have a cowl or ruff of old skin that adheres behind their head. The best explanation is simply that this is yet another mythical serpent, with many seemingly fantastic attributes. 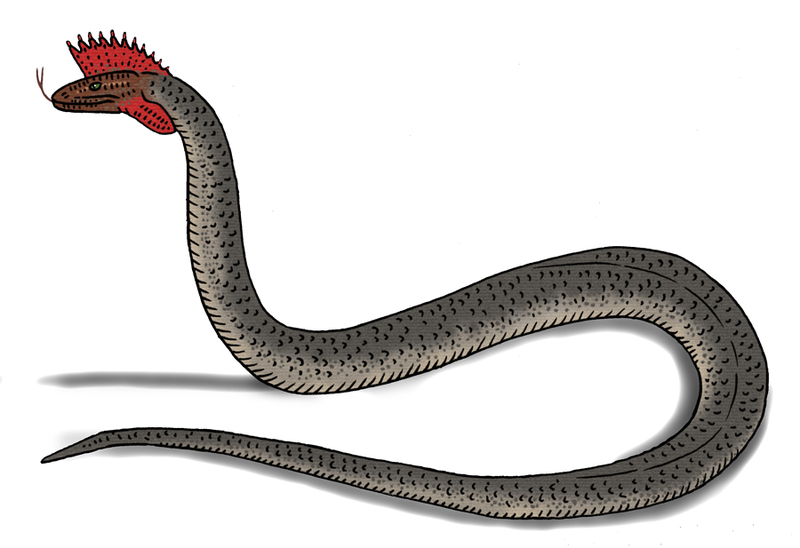 Should such a giant and flamboyant snake actually exist, some of its mythical traits, like a deathly stare and a diet of maggots, should be regarded as simple superstition. The Crowing Crested Snake (Gallophis giganteus) is a very large venomous snake (Elapidae) that mainly inhabits thickets and tall trees in eastern and central Africa; it grows up to 6 metres long. Having a brownish grey body that can blend in fairly well with the branches and shadows, the males possess a large cockscomb and wattles resembling those of a rooster, made of lobes of scaly skin. This crest becomes bright red during the breeding season. The Crowing Crested Snake mainly feeds on small and medium sized mammals and birds; a favoured hunting strategy is to wait on an overhanging branch, striking at animals that come into the shade. Likewise, it will sometimes wait in higher branches, concealed, striking at birds that come to perch. Unlike most other snakes, it has the ability to vocalise, albeit crudely. It exhales powerfully, whilst slightly contracting its windpipe, making a strained, shrieking noise that some liken to the crow of a rooster. Short, puffing exhalations, in a similar way, can make a noise best described as coughing or clucking. The venom of this snake is fairly strong, and can kill an adult human if left untreated.